Come winter, I crave hearty, comforting dishes and I pull out my Balkan food cookbook, sitting lonesome, shunned and tucked away the rest of the seasons. As earthy as the Balkan dishes are, they possess their own intricacies and flavor pairings sensibilities, and every winter I look at the cookbook for a refresher on the Balkan cuisine subtle flavor pairings brilliance. In Israel, a melting pot of cultures, one of my good friends growing up was of Romanian descent. Later on, while in the Israeli army, I made a friend, I cherish to this day, who is a third generation Israeli of Bulgarian background. There is a small Greek community in Israel, mostly from Saloniki. The elder generation survived the work camps during WWII. The countries included under the Balkans umbrella stretch to Turkey and some lists even include parts of Italy. I mentioned in my Romanesco Floret Fritters in Beer and Honey Batter post that I was introduced to Kashkaval at the home of one of these friends. Read the Romanesco post for more detail. A note on dry herbs: I usually use fresh tarragon, sage, basil, oregano and mint, but what better timing to use them in their dry form than, relatively speaking, barren winter. I am reminded again at the sensational pairing, as in this dish, of oregano and mint, and take much pleasure at the astounding results. I tend to use less than what is called for in original recipes, with some exceptions if the original measurements make sense to me. A note on photography: I have been frustrated somewhat. With the exception of my photograph Indian Shakshuka - Poached Eggs in Curry Sauce, I always want to bring my food styling and photography up by a notch. I have a Pinterest account now for awhile but it has been mostly dormant. Recently I have been engaging in what seems like mindless pinning, but if you study my boards you can see how they inspired me and made me think hard about depth, color palettes, textures and dimension in my photography. Lastly, I was not sure whether to be embarrassed or proud at the state of some of the pots and pans in my kitchen cupboards until I used one with the golden patina as a background in this photo shoot. Saute onions, garlic, celery and jalapeno in oil for a few minutes until soft and onions are translucent. Add the bell peppers and saute for a few minutes further. Add tomato, tomato sauce, paprika, oregano, mint, salt, pepper and lemon and cook for few minutes. Add the Cannellini beans and cook for 10 minutes. Add water, bring to a boil, turn down to simmer on low/medium heat and cook covered for about 3 1/2 hours or until Cannellini beans are super creamy and soft. Mix occasionally and add water if necessary. 1. 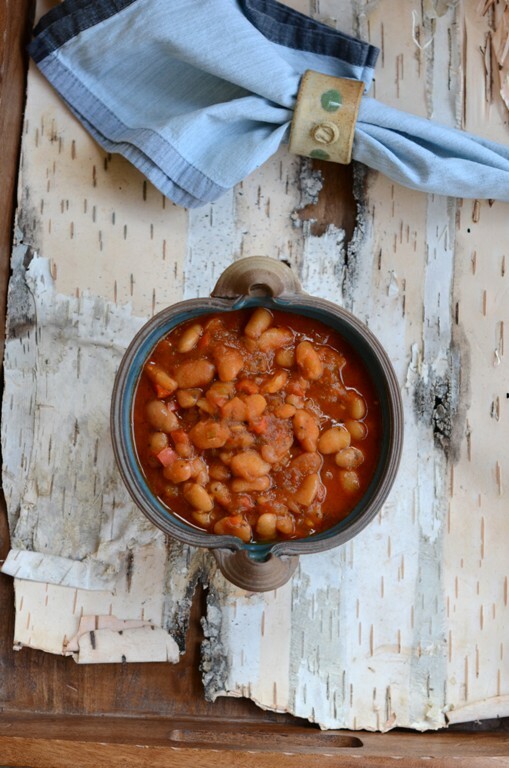 You can substitute canned beans for the the dry ones. 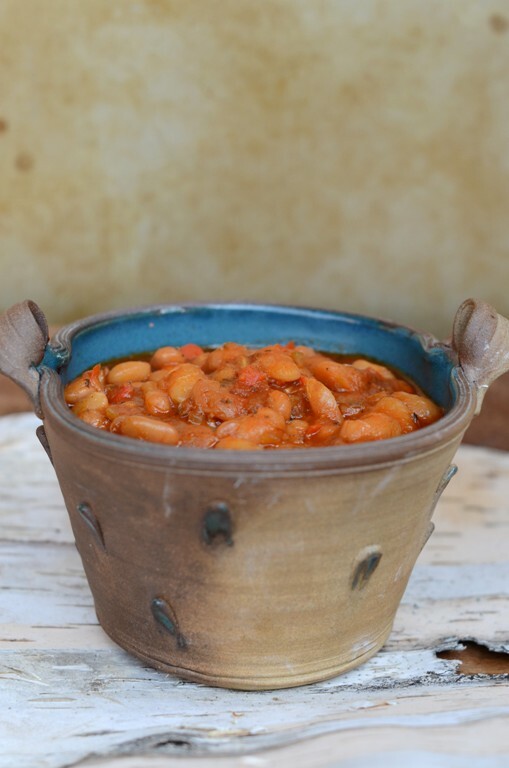 Use 4-5 cups rinsed and drained canned beans, approximately 3-4 15oz cans. 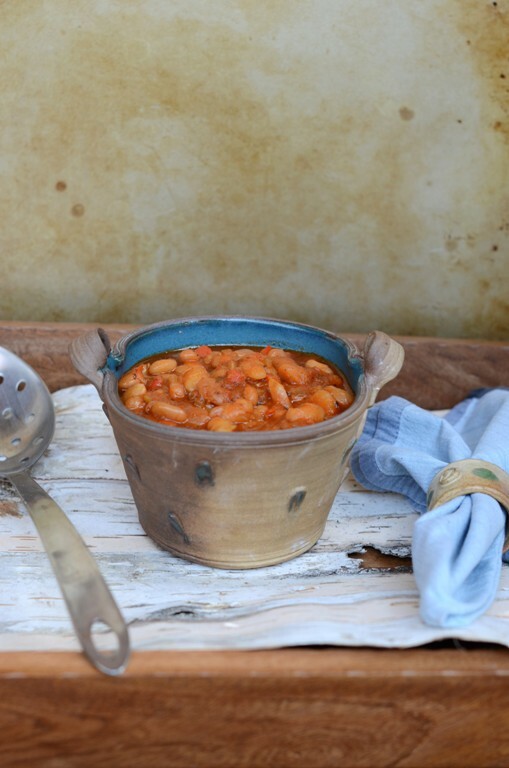 Cook stew for 30-45 minutes after adding beans to the mixture. You might want to start with adding 4 cups of water first and add more water if necessary. 2. You can cook stew on stove and once beans added you can continue cooking in a slow cooker or a pressure cooker according to directions. I do not own either a slow or a pressure cooker, so I am not able to give you directions. 3. This dish is a chili of sorts you can also add some more water and serve it as soup. Mmmhhh, marvelous! So comforting and mouthwatering. Perfect with those polar temperatures that we are experiencing. Looks so good, warms your soul. TY. Had some leftovers for lunch. Today was colder than other days on this unusually warm winter, so it was perfect!! That sounds delicious, I could use some stew like that on such a frigid day today! Thx! I wish I could have sent you some for warmth and nourishment! Benny Saida is my favorite cookbok author in Israel and his Balkan cookbook is excellent. Made a similar recipe a few weeks ago based on a recipe given to me by someone in the Republic of Macedonia,Saida's recipe is indeed authentic. TY Sarah. I know, right?! & you would know with your background! :) I have his book in forever!! Love, love it!! Your photos are always amazing but Pinterest is a great way to get inspired! The soup looks so comforting and that prop you used.. great pick. Aww Kankana, means a lot. Hugs!! I was digging deep while pinning on my boards:). Very inspirational and to me a way to brain storm and process too:). Shulie, this one is from my part of the world, but in Serbia, it would inevitably have a few smoked pork ribs in it:) I am not familiar with this cookbook, but until I write one on Balkan cooking, I'll try to find it. Perfect - I'm in the mood for beans on this wintry, cold weekend. Photos are fantastic! TY so much Katie. I use canned beans all the time but it is a nice reminder when using dry, how creamy they come out at the end of the cooking process. Encourages me to use dry more often. Stay confidant, my friend! You are quite talented. Thx EA looking forward to following your boards as well. The color palette one in particular got me thinking a bit though I don't have a photo with these shades on that board. TY Miss Lora. It is really like chili but the oregano/mint & touch of lemon gives a chili a different welcome twist. 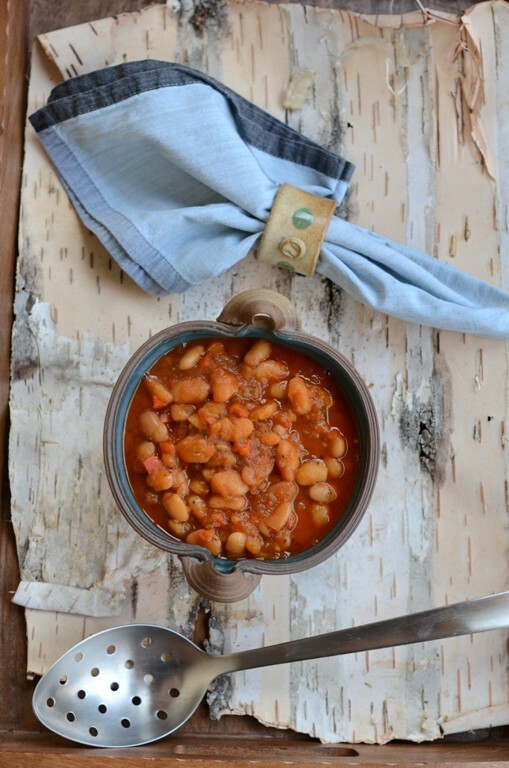 Love the styling on this post, and now I'm craving stew! TY Girlie much!! I would totally share it with you! Beautiful styling Shulie, love the shot from above! As for the recipe, it sounds like such a bowl of comfort on a cold winter day. TY Terra. I am trying to recall where did get the pot from??! Looks like such a comforting dish! I love stews like this. Great job with styling Shulie. I am not really a lot into styling. I mostly just concentrate of lighting and composition in my photos keeping colors in mind but never really take an extra effort to 'style' them with right props. I know I need to work on it eventually but right now I try to keep it simple. Thx bunches Chimnayie. Me too. I try to keep it simple. If you add too many items, trick it to have it look cohesive and not muddled. I like to rely on textures, contrast and maybe one day I will dare complex with many items just for fun. A true comforting delight ... and I have the same napkin. Twinsies! TY Rebecca. The bark is my neighbor's she whipped into flat shape. I am borrowing it until she needs it back when she builds furniture. She uses it for texture of furniture she builds and touches around her house. I can't wait to make this. What do you think about baking it instead? Possibly you could do it in the oven especially with canned beans. Try to add less water first and adjust later. The bake texture will be different than the cooked on stove. I really couldn't tell you about dry beans in the oven, how long it would take for them to cook in the oven. TY Kariann, I can't wait to hear when you try this recipe. Come to think if it does it get cold down at the Keys? I hope so:). Looks delicious. I like that book too. Your recipes look so good and your flavoring style appeals to me but I think another good reason to get inspiration from your cooking is that you have so much energy! Aww Faye. Thank you so much means so much coming from you!! Put a smile on my face!! What a hearty pot of soup. Unlike the rest of the winter this year, we had a HUGE temp. drop for the past 2 days and this is exactly what I would love to have (only too lazy to cook today.. he hee. I LOVE your soup pot and the so very creative shape it comes in. really lovely photographs too. I love that pot! It's just perfect for a hearty stew like this. This looks incredible!! One of my favorite parts about living in Israel is being introduced to all those cultures and foods. And Shulie, your photography is sensational!! Always. What beautiful styling and what is that background thingie..it looks so rustic..Love the comforting stew. Such a delightful and warming stew! I do love the combination of herbs here, and since I live in CA I still have them in abundance in my garden. But I do dry them as well, since I can not use them fast enough. THis looks delicious and right up out alley! Can't wait to try it!